Midwives are absolutely amazing and play such an important role in the birthing process for new mums. And this beautiful birth story has a delightful twist – the midwife that delivered new mum Brittany Ellard Perrymen’s baby also delivered Brittany 25 years earlier. Caroline Ellard Perryman was certainly in good hands when she came into the world last month. In fact, she was delivered by the same midwife who delivered her own mum, Brittany, in 1990. And now the story, as well as the images of midwife Daphney holding both baby Caroline (in 2016) and baby Brittany (in 1990) have gone viral. The three women, Brittany, Dawn and Daphney reunited while Brittany laboured with Caroline. After labouring all day (and Daphney heading home after her shift), Daphney returned back to work just in time for Caroline to be born. 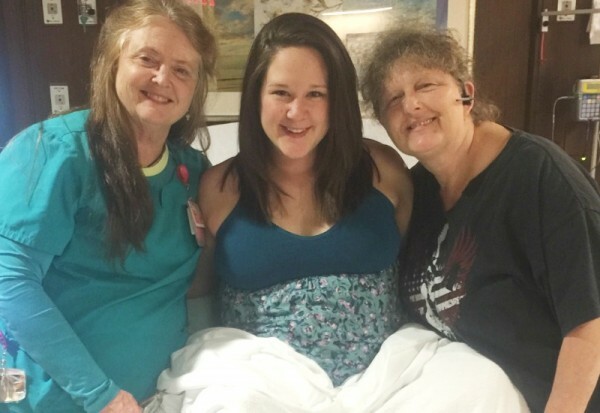 “There I was, 25 years after she helped me take my first breath, relying on sweet Daphney. Trusting her when she said it would be okay, following her directions, listening to the blessings she was speaking over our Caroline. Caroline came that evening, with Daphney by our side,” Brittany writes. Daphney, who works at Brookwood Medical Center in Alabama, has been a nurse for 41 years and has responded to the unexpected attention with humility and grace. This Facebook post is a lovely reminder of just how important midwives, nurses, doulas and support staff are in the delivery room. What a beautiful way to remember such an momentous occasion for Brittany, Dawn and baby Caroline.